In general, there are two types of acne scars, the pitted scars, and the pigmented ones. Pigmented scars are usually brown or red in color and remain on the skin after a pimple disappears. Even though they can affect your looks and confidence, they can disappear post-treatment, or they can go away on their own after a few weeks or months. Pitted scars, on the other hand, occur when skin tissues beneath the acne get damaged. This type of scars looks like dents on the skin, and are generally referred to as pockmarks. Both types of acne scars have their own treatment methods that remove or conceal their appearance. Acne scar treatment involves using creams or lotions that have whitening compounds. Such compounds can clear away the pigment from the scar and remove one’s scars. However, which cream or lotion to use can be best prescribed a skin expert who understands various skin types and acne scars and knows which treatment is suitable for which scar type. Acne scar skin care is slightly more complex for pitted scars, as these scars are difficult to remove. Some dermatologists use protein stimulators to induce skin cells to form the vital proteins collagen and elastin. When the cells surrounding the scars begin producing these proteins, the skin can be plumper and the depth of scars can become shallower, also reducing their pockmarked appearance. It is suggested to take the help of a dermatologist. This is especially true when you want great and noticeable results fast. 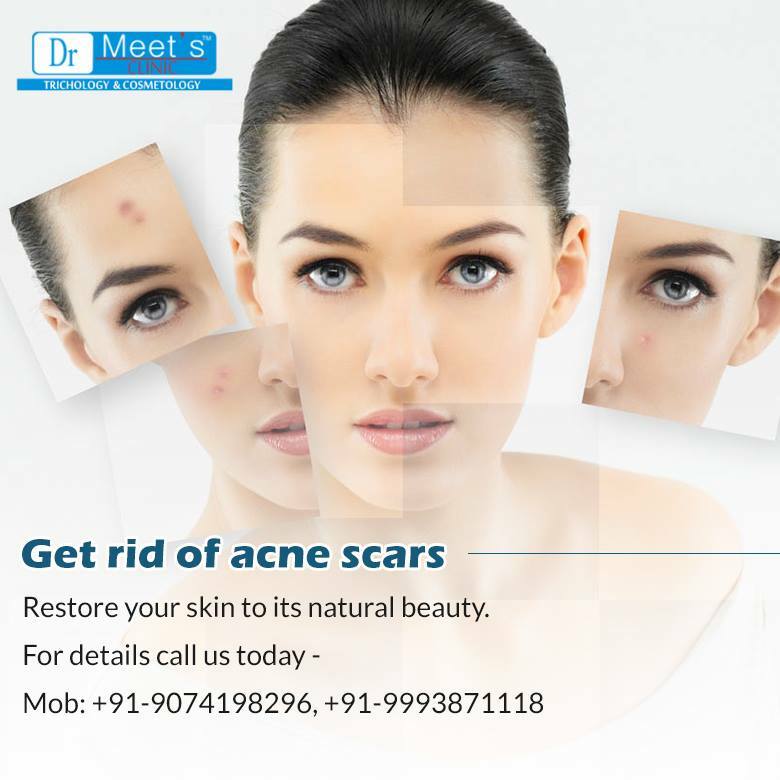 Dr. Meet is your one stop destination for acne scar treatment in Indore and surrounding areas. We provide a range of skin and hair treatment to help you get that appeal and confidence back. We also specialize in Psoriasis Treatment, so call now to schedule an appointment.